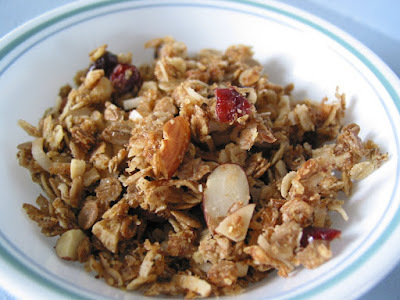 This is my version of my friend, Liz's recipe for granola. Eat it for breakfast with milk or grab a handful for a healthy snack. Mix well and spread evenly on a cookie sheet in a single layer. Bake at 350 for 15 minutes, then stir. Bake 10 more minutes on 250. ***You can add any dried ingredients that you like, for example: flax seed, pumpkin seeds, any nuts, any dried fruit. I've used a dried fruit mix at Smith's that included dried bananas, mangos, pineapple, papaya, cranberries and cashews. I chopped about 1 c. of it up into smaller pieces. Or you can add raisins and craisins if you have them on hand. **You can use more or less honey and oil/butter depending on the texture you like.